Another popular trout lake and reservoir lures in the UK and Europe. The Dawson's Olive comes into its own in summer months when main feeding occurs on damselfly nymphs. Try the edges of weed beds for trout patrolling close in for this food. In summer months when the mass migration of Damselfly nymphs occurs, use a floating line and long leader with a slow figure of eight retrieve or a series of short twitches. The rest of the year can produce using an intermediate or sinking line with a varied rate of retrieve. The Dawson's Olive can be tied with different coloured marabou for the tail. A slight difference like this in the design of the lure can prove very effective. 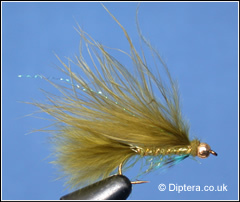 The Dawson's Olive pictured is tied with Straggle Fritz rather than the traditional Chenille Body and uses a thorax of Olive Ostrich Herl to give a bit more pulsating movement at the head.